If you need to ship a car from North Carolina to Hawaii, you should know that the process can be quite complicated. That’s because whenever you ship any item overseas there are additional factors that have to be accounted for. And this is especially true if you are shipping an automobile. That’s why you should only work with a carrier that’s experienced in overseas shipping, a carrier like Direction Connect Auto Transport. We have over 20 years of experience moving vehicles all over the country and overseas as well. We’re able to make moving cars to or from Hawaii a simple and worry-free process. Here at Direct Connect Auto Transport, we know a large part of creating a carefree experience for our customers is providing them with a robust set of options that caters to their needs. We know that car transportation is not a one-size fits all situation. Below you’ll find a number of shipping options we have for customers who need to move a car from North Carolina to Hawaii. Roll on roll off shipping, or RoRO, is also the most cost-effective way to move a car by sea. It is also the most common method of moving vehicles by sea since ships routinely carry automobiles using this method, especially from North Carolina to Hawaii. With RoRo, your vehicle is rolled into a carrier vessel and then secured. Once it arrives at Hawaii, it is just rolled off. If you’re on a tight timetable and a budget, RoRo shipping is likely for you. If you’re having a car transported from North Carolina to Hawaii, chances are it will be leaving out of Honolulu Harbor. Honolulu Harbor is the principal seaport of Hawaii and is vital to the island. It handles over 11 million tons of cargo every year. Thankfully, as a natural harbor with good protection from surge action and wind, Honolulu Harbor is more than up to the task. 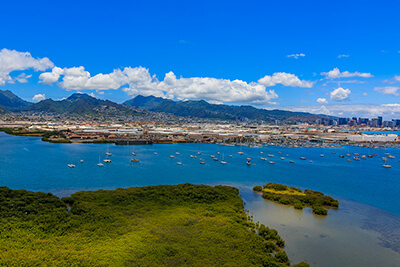 Besides handling the main shipping duties for the island, Honolulu Harbor also hosts facilities for excursion, fishing, passenger and research vessels. When you need to ship your car from North Carolina to Hawaii, you shouldn’t leave anything to chance. Work with Direct Connect Auto Transport and rest assured that your vehicle will arrive on time and in pristine condition. We will make sure that the process is catered to your needs to ensure your satisfaction. How can I schedule my North Carolina to Hawaii auto shipping order? Can I track the progress of my North Carolina to Hawaii transport online? How do I get a quote for shipping my vehicle from North Carolina to Hawaii? You can either click on the Get Quote link for a free instant online quote, or call us to receive a quote from a professional shipping coordinator. You will need to specify where in North Carolina the vehicle would be picked up and where in Hawaii you need the vehicle delivered. You must provide the zipcodes for each so that our auto shipping calculator can provide you with our most competitive instant auto transport rates.